Throughout my career in retail, I’ve managed only two other stores besides the one I’m managing now. In between, I have also managed several cosmetic counters in department stores. I’ve learned a great deal about the technical aspect of management, but more so about the employee aspect of management. And for me, the employee aspect is the most important, yet the most challenging. Now I have to admit that when I first started managing, I sucked, because I hadn’t developed people skills. And in management, it’s all about people skills. I was extremely demanding and intolerant; assuming that my employees would work the same way that I did. So when they didn’t live up to my expectations, I got very frustrated and verbal about how I felt. I think I could have, had I been wiser, handled it much better than I did back then. I believe it was more about me trying to control everyone as a way of letting them know that I was the boss. But in reality, I was out of control because I didn't know how to manage properly. But over the years, I’ve discovered that everyone works differently and has different strengths and weaknesses. And as a manager, it's up to me to observe what people's strengths are and empower them to use those strengths. But at the same time, guide and help them to improve on their weaknesses. Management takes a lot of patience. And that's another thing I had to learn because I'm not a very patient person. I finally had to ask myself the question, "How would "I" like to be managed?" I like to create an environment that is fun because it makes coming to work so much more enjoyable. I do think it’s possible to have fun and work at the same time. I also feel it’s very important to let your staff know that they did a good job. At the end of each day, I make it a point to tell every employee, “Thank you for your hard work”, because it not only allows them to feel appreciated, but also feel positive about themselves. When an employee feels part of a team, they know that their part is needed to make up the whole. I think this allows everyone to feel that what they contribute to the workplace is important and strive to do their best. I’ve become more tactful and word wise in my management. I am more conscious about the way I speak to an employee when something needs to be addressed. I will usually take a few days to think about what I want to say, so that I say it in the most productive way. Personally, I have been most influenced by managers who managed me, and led by setting a good example. Those were the managers who gave me the foundation for my own skills. So perhaps the art of people management is not really about managing, but more about leadership and coaching. I've learned a lot over the years about what it takes to be a good manager. Good morning, Ron. Once again a valuable post. I agree that we have to learn how to 'handle' people in the workplace and elsewhere. In my days at the top I had to learn the strengths of people on my team and elsewhere. It felt strange at first but soon made sense. My current presidency is no different and I'm always careful thank the members when necessary. We meet together twice a month so there's often a chance I will forget my manners. Last time I covered it by sending thanks to team members by letter and was surprised at the response but was pleased that I'd done it. Great post, Ron. This takes me back to my days in retail management. You are so right about the people skills. You have to learn to read a lot of different personalities, and then adjust your own personality to communicate your wants and expectations. Not easy! I most struggled with being Word Wise. I have a tendency to respond quickly to a situation, with comments like, "Are you kidding me?" instead of taking a breath first and being calm. Tact is NOT my middle name. Lol.....on the other hand, people find me entertaining and want to be my friend.....bahahaha.....have a super weekend, buddy! Ron has said these things many times!! While he doesn't manage a retail store, he has had occasion over the years to be the foreman on various job sites. People are people though, no matter what the specific job. He has observed how co-workers do things and when in that position to utilize their best skills he finds it works much better in the long run. Not all foreman are like that obviously. Some just want to be 'in control'.. yes, you said it exactly! He's seen foreman giving people tasks that they aren't suited for, then confronting them when things don't go right, etc. Seems they are more concerned with that title... having the guys see who the manager is... but then they just end up getting yelled at by someone higher up than they are because the job didn't go as well as it should have. All good wishes for your new job! Sounds like things are going well. And since you're open to learning, growing, and sharing you'll be a great boss, I'm sure!! Excellent post, Ron! For a very brief time I was an assistant manager of a women's clothing store, but quickly realized I did not have what it takes to be in management. You're right, it takes patience. I can take full responsiblity for my own management, but not for others. Management is not for me. I bet you're a wonderful manager and that the staff loves you. You've got such an upbeat and positive energy, how could they not love you? Ron, killer post! Regardless of how you managed years ago, it sounds to me like you've gained a lot of knowledge through experience. I have never managed but can imagine what it must be like to not only tend to the practical part of management, but also the people/employee part. That's got to be challenging. Currently I have a great boss. Like you, he creates an enjoyable and relaxed atmosphere, but we know that their is work to be done and we do it. He is also very appreciative of our work and let's us know. It's very much a place of team work. I feel lucky to have this job. 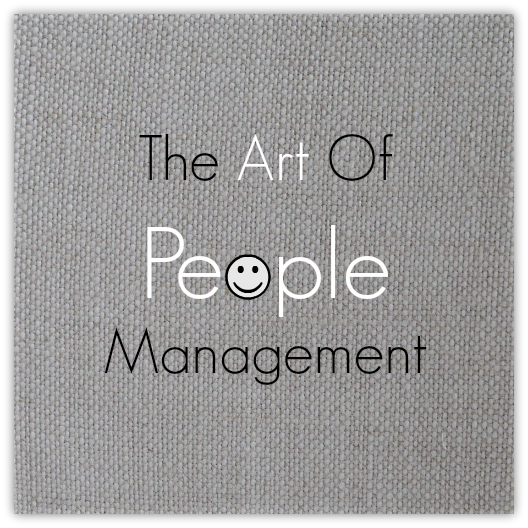 "So perhaps the art of people management is more about leadership and coaching." Boy, Ron, this post should be required reading for all of Corporate America! You share so many great insights, admit your earlier faults, and do your best to make your employees feel valued and respected. I wish you were my boss!!! I've lost count of the gutless, paranoid egomaniacs I've had the displeasure of working for over the years. These are people take their issues out on the employees, instead of getting the therapy they so desperately need! I recently read a quote that said tact is the ability to make a point without making an enemy. I think you truly exemplify this concept. Your employees are very lucky indeed! I hope you manage to have yourself a great weekend, buddy! Take care! Great article. Ron, I too, expected others to exhibit and live by the same virtues as myself many years ago. I realize if I was in the same management position today as way back then I would operate much differently. I think one of the most important on that list is saying thank you. I completely agree. We get so busy at work that my boss and those around never say thank you.... and it makes you think, "Why do I even bother." But lately my boss has been saying thank you and it makes me work even harder... it is a GREAT motivation, knowing you are appreciated! I am a terrible people manager - I was put in that position when I was 19, managing a department with much older people - disaster. The work got done but no one was happy, me in particular. Over a 40 year working period I had people to supervise and I never liked it. Working with more than one person is beyond my abilities - So if you have learned to manage people well I say good for you and the them. No easy task, that. This is such a great post and comes at a great time for me! I actually just took a new job at a very similar place only to get away from my current boss. He does not know his business nor how to be a boss. The tips you mentioned would be so helpful for him. Too bad he cant see this! You've made some really good points here, Ron. There are GOOD managers and bad; GOOD leaders and poor. 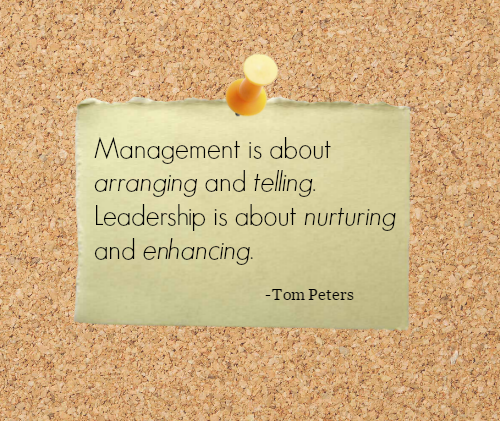 It's pretty much summed up by Tom Peters' quote -- there's a huge difference between managing and leading! Many of the good managers I've worked for have a natural knack for working WITH people, not scaring them into working. Most, I suspect, have received specialized management/leadership training, too. Yes, we know people will work if they're terrified (over the threat of losing their job, for example), but they work BETTER and HAPPIER if they can use their unique skill set and know their contribution is valued and appreciated. Interesting post, my friend. Lots here to think about -- have a wonderful weekend! "I do think it’s possible to have fun and work at the same time." Fortunately, this is one of the principles the founders of my company believe in strongly. Hence, the Kegorator and barbecues and employee appreciation days. It's little touches like those that keep employees happy and make them feel respected. Sounds like you've got a great management style yourself, Ron - you'll do fine! Ron, I so enjoy these posts where you share things that you've learned. And you're always so honest about the challenges you've had, but then share what you've learned. I can so see you being a motivational speaker because you inspire others! All the things you've listed here are of such great value to being a good manager. I think one of the most important is saying thank you because as you shared, it makes employees feel valued and strive to do their best. "In my days at the top I had to learn the strengths of people on my team and elsewhere. It felt strange at first but soon made sense." Yes, it does make sense doesn't it? Because when you know what people's strengths are, you can empower them to use them in the best way!
" Last time I covered it by sending thanks to team members by letter and was surprised at the response but was pleased that I'd done it." Good for you! And I bet they were surprise because hardly anyone every takes the time to thank others for a job well done! "You have to learn to READ a lot of different personalities, and then adjust your own personality to communicate your wants and expectations." Yes, and I couldn't have said that any better. And you're right, it's not always easy. "I have a tendency to respond quickly to a situation, with comments like, "Are you kidding me?" instead of taking a breath first and being calm. Tact is NOT my middle name." Oh trust me, I can be the SAME way. Which was something I had to learn. I find that if I take a day or two to process what I want to say in a positive way, it works out better because no one gets defensive or hurt. "Lol.....on the other hand, people find me entertaining and want to be my friend....."
And I'm not at all surprised at that because I can tell, you are both entertaining and make a GREAT friend! Thanks so much for stopping by and have a SUPER weekend, my friend!
" People are people though, no matter what the specific job. " You are spot on about that, Mary, people are the same no matter job. "He has observed how co-workers do things and when in that position to utilize their best skills he finds it works much better in the long run." That's EXCELLENT. And he's right! "Seems they are more concerned with that title... having the guys see who the manager is... but then they just end up getting yelled at by someone higher up than they are because the job didn't go as well as it should have." Exactly! And that is something I had to learn myself. I think when I first started managing I was very insecure about how to manage, so I used "force" and "control" instead of awareness. Thank you, and yes...I am REALLY loving this new job because I'm growing and learning. Have a maaaaavelous weekend, neighbor! And thanks for stopping by!
" I can take full responsiblity for my own management, but not for others. Management is not for me." You know, for a long time after I had bad experiences with being a manager, I didn't thing I would ever want to try it again. However, I've learned a lot over the past years and am trying to apply those things to my management skills now. I've approached this new job with a whole different attitude and outlook. Thanks so much for stopping by and for you sweet and encouraging words, girl. Have a wonderful weekend too! For a long time, I didn't think I would ever what to have a management position again because I found it very challenging. But I decided to approach this new job with a different outlook and attitude, by taking all that I learned and then applying it. And so far, it seems to be working well. "Currently I have a great boss. Like you, he creates an enjoyable and relaxed atmosphere, but we know that their is work to be done and we do it. He is also very appreciative of our work and let's us know. It's very much a place of team work. I feel lucky to have this job." Sounds like you have a great boss and a great working environment. Yahoooooooo to you! Thanks so much for stopping by, buddy. Have a stellar weekend! I've learned a lot through trial and error and what works and doesn't work in management. And as I shared, I'm STILL learning. But I have to say that I'm really enjoying this new management position because I think my whole attitude seems different. And also, the staff I work with are wonderful, so it makes it easy. "I recently read a quote that said tact is the ability to make a point without making an enemy." LOVE that!!!!!!!! And how true! Amen! Thanks so much for stopping by and for encouraging words, buddy. Appreciate it. "Ron, I too, expected others to exhibit and live by the same virtues as myself many years ago. I realize if I was in the same management position today as way back then I would operate much differently." Me as well. Over the past couple of years I've grown, not only in management but also as a person. So I think it has enabled me to bring something different to the managing table.
" We get so busy at work that my boss and those around never say thank you.... and it makes you think, "Why do I even bother." But lately my boss has been saying thank you and it makes me work even harder... it is a GREAT motivation, knowing you are appreciated!" You said it, Katherine! And that is something I've learned from previous managers who NEVER said thank you. As you shared, when a boss says thank you, it gives you more motivation to do a great job. Grace, everything you shared is exactly how I used to feel about management. And to be honest, I never thought I wanted manage again. But I feel different in this new job. I decided to take what I've learned (the good and the bad) and use it to be a better manager. And so far, it's going well. Thanks so much for stopping by, my friend. Have glorious weekend! I decided to share this post because I've learned so much over the years about management. To be honest, I didn't think I ever wanted to manage again, but when this new job came along I thought it was time to give it another go. And so far, it's going well. "here are GOOD managers and bad; GOOD leaders and poor. It's pretty much summed up by Tom Peters' quote -- there's a huge difference between managing and leading!" I agree, and when I saw that quote I thought, "How spot on he is!" "Yes, we know people will work if they're terrified (over the threat of losing their job, for example), but they work BETTER and HAPPIER if they can use their unique skill set and know their contribution is valued and appreciated." I LOVE how you said that!!!!! And to me, work should be a place where you feel happy because you do a better job; thus, the company does better. Thanks so much for stopping by and sharing your insight, my friend. Have a wonderful weekend too! "Fortunately, this is one of the principles the founders of my company believe in strongly. Hence, the Kegorator and barbecues and employee appreciation days. It's little touches like those that keep employees happy and make them feel respected." Yes, Mark! And whenever you post about your job and share those employee appreciation days, I think to myself, " That's exactly how EVERY place of employment should be!" I'm so happy that I took this new job because it's teaching me so much. Well Hello my old friend! It's been forever since I've been in the blogosphere but I'm so happy that I logged on this evening; this was a great post. You made some excellent points about managment and what it takes to be a "good" one... I wish that I had more bosses like you. I can't complain about my supervisor now though she's just as awesome as you. Definately takes patience and learning how to say things appropriately. I've considered applying for a supervisor role in the company I work for but honestly don't think I'd make the cut. I'm short tempered and when I don't like somebody I have a very hard time hiding it... not good for a manager. Anyways thanks so much for still being out here in the blogger world. I'm going to try and post more often.. stop back anytime you like! Have a wonderful weekend!!!! I decided to share this post because I've learned a lot about management and STILL am. I never though I ever wanted to manage again because I didn't have the greatest experiences back then. However, when this new job came along I decided to try it again and take what I learned (the good and the bad) and put it to use. And so far, it's going well. Also, the staff is just wonderful and has welcomed me into this new position with openness, so it made it easy. "I think one of the most important is saying thank you because as you shared, it makes employees feel valued and strive to do their best." I have found that just saying a simple, "Thank you", makes a world of difference in how people feel about themselves. They feel valued and appreciated. OMG!!!!!! I was soooooooooo HAPPY to see your comment here! You have no idea how many times over the years I've thought of you and wondered how you were. Are you back blogging again??!?! If you are, please either leave me your blog URL in another comment, or you can email me because I no longer have it. And, YES, I will most definitely stop by. Can't wait!
" I've considered applying for a supervisor role in the company I work for but honestly don't think I'd make the cut. I'm short tempered and when I don't like somebody I have a very hard time hiding it..."
Oh trust me, I'm the same way so I understand. However, over the years I've learned how to temper my temper and take some time to think about what I want to say before speaking. But it's take great effort to do that - HA! Thanks SO MUCH for stopping by, dear friend! Have a faaabulous weekend! So true! When I had a management position at the community mental health center, I took it at a time when people were really unhappy with how they were being managed. I paid attention! I sat each of the support staff members down individually to find out what they wanted to see changed, what particular role they wanted to play so they felt they were contributing. And I also met with the clinicians to find to what they were hoping to have happen. I really tried to foster a fun, collaborative environment. I think being the manager you'd want to have is the only way to go.
" I paid attention! I sat each of the support staff members down individually to find out what they wanted to see changed, what particular role they wanted to play so they felt they were contributing. And I also met with the clinicians to find to what they were hoping to have happen." Way to go! And I bet they loved having you as their new manager!
" I really tried to foster a fun, collaborative environment. I think being the manager you'd want to have is the only way to go." Yes, I think so too because you create an environment that makes people want to do a good job thus, the whole company prospers. Thanks so much for stopping by, my friend. Hope you're having a FAB weekend! It sounds like you & I manage in very similar ways. If an employee does even something tiny above or beyond their normal responsibilities, I'm all over them with a thank you, hoping to encourage them to think about what more they can do more often. If a time should arise where I need to correct an employee, it's always in private & is usually more about suggestions how to do it better in the future. I have had too many managers think it's perfectly okay to ream me out in front of my fellow employees. "If an employee does even something tiny above or beyond their normal responsibilities, I'm all over them with a thank you, hoping to encourage them to think about what more they can do more often." Yes, exactly, Benze. I think acknowledging a job well done encourages an employee to take the initiative to do more, and also feel good about themselves.
" If a time should arise where I need to correct an employee, it's always in private & is usually more about suggestions how to do it better in the future. I have had too many managers think it's perfectly okay to ream me out in front of my fellow employees." AMEN! And let me tell you that I've have MANY bosses ream me out or correct me in front of my fellow employees purposely to make me feel bad. I agree, it should always be done in private; suggesting how to do it better in the future. Sounds like you're an excellent manger, my friend! I'm so glad I got this opportunity to manage again because it's teaching more and more about people skills. Happy Sunday, my friend, and thanks so much for stopping by! i agree with myself below, i mean er um, valerie. great post. you: demanding and intolerant. i don't see it. i do like how you said you have to observe people, know what their strengths and weaknesses are then act. that's so true, ron and not many people know that. dealing with people anywhere means constantly adapting. it's give and take on both sides. not my way or the highway. "i agree with myself below, i mean er um, valerie." "you: demanding and intolerant. i don't see it." I used to be very much that way, but thank god I've changed. And I honestly think I was that way as a manager because I didn't know how to manage, so I got very frustrated and forceful, which didn't help matters.
" dealing with people anywhere means constantly adapting. it's give and take on both sides. not my way or the highway." VERY wise words, my friend. And so true! Thanks so much for stopping by. Hope you're having a super Sunday! I oh so agree with all your suggestions. Leading by example, saying thank you and MEANING it...all things that we should do, as leaders. I have supervised and coached a lot of different people over the years and YES!!! it is about finding their particular strengths and how they work best. I always made a real effort to show my staff that I cared about them as individuals and that I was ON THEIR side when it came to the "big boys" upstairs, trying to get as much in terms of perks, pay raises...as I could, to show people on my team that they were valued and that I wanted them to know it, even if they didn't get that kind of acknowledgement from anyone else. It worked!!! I had some of the best reps. in my groups, always. Management wanted to understand why and that at times was hard to explain when they were too often still focused JUST on profits and not enough on people. Can you tell this is a topic near and dear to my heart? "Can you tell this is a topic near and dear to my heart?" Yes, I can, Geraldine! And everything you shared here is BRILLIANT! You sound like an amazing leader and coach!
" It worked!!! I had some of the best reps. in my groups, always. Management wanted to understand why and that at times was hard to explain when they were too often still focused JUST on profits and not enough on people." AMEN! Corporate sits in their offices and knows NOTHING about people. As you said, all they're interested in is PROFIT. However, if they took the time to invest more interest in the people who were working for them, by making the workplace an enjoyable place to be and acknowledged the value of these people, they would be MORE profitable. It should all start at the top. Thanks so much for stopping by and sharing your insight and knowledge on this post, my friend. WOW....that was great!